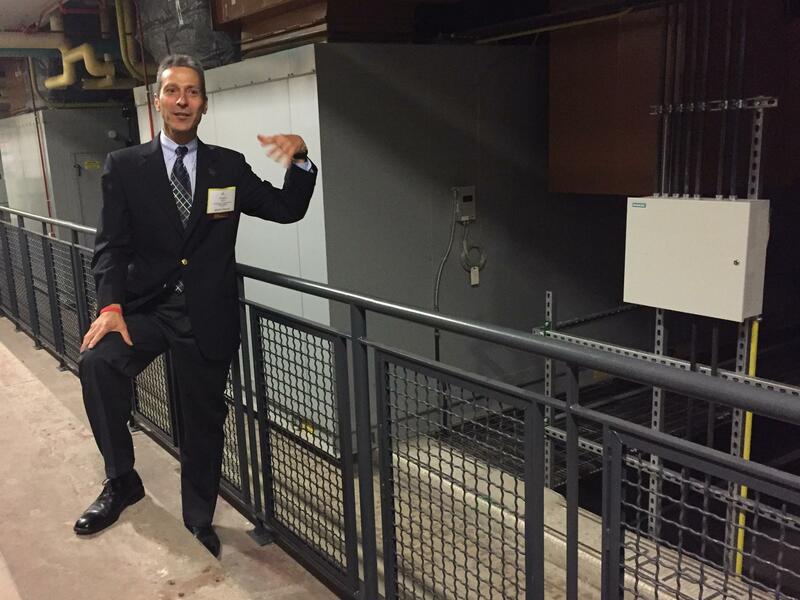 Gregory Reed tours a former school now becoming a lab for energy research in Pittsburgh. Reed says he's focusing on how microgrids can provide reliable, resilient and locally produced energy. 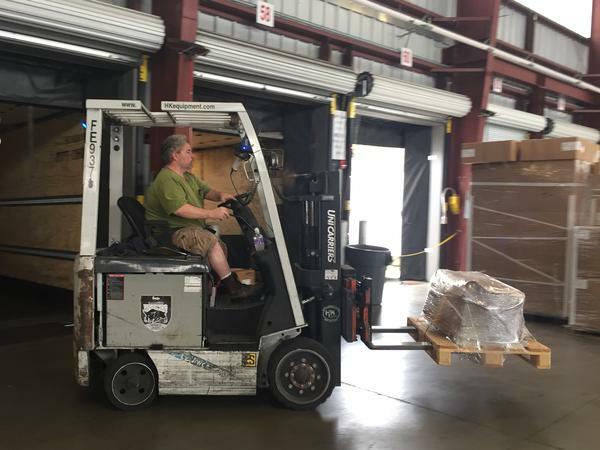 Gene Lutz drives an electric fork lift powered by renewable energy at Pitt Ohio, a trucking company with an office in Harmar, Pa. The firm has invested in solar and wind energy, along with a bank of storage batteries, to create an independent microgrid that would hold up in a storm. Researchers hope to build more of these and link them together to create a reliable backup supply. When President Donald Trump announced the U.S. would withdraw from the Paris climate accord, he said he represented "Pittsburgh, not Paris." Pittsburgh Mayor Bill Peduto disagreed. He traveled to Germany this week as part of an unofficial delegation of more than 100 Americans, American officials and business owners who say they are still committed to climate talks taking place in Bonn. One element of Pittsburgh's climate strategy has been encouraging innovation in a technology known as microgrids. Usually, power grids rely on a far-flung network. For example, a person making toast might be drawing electricity from miles away. A microgrid is a local, independent power grid that can run without electricity from the main network. A pilot site for microgrids is at the Pitt Ohio trucking company in nearby Harmar, Pa. Jim Maug, director of building maintenance, eagerly showed a reporter the building's green credentials last month. A wind turbine twisted near the parking lot. Solar panels tiled the roof. And in the truck bay, electric forklifts ran on batteries fueled by the renewable power. "We're anticipating about a seven to eight-year return on investment," said Maug. The project cost about $325,000, he added. Gregory Reed, head of the energy program at the University of Pittsburgh's engineering school, designed the grid. It includes a battery bank to store the energy for times when the sun does not shine and the wind does not blow. During a storm, he said, even if the local power plant shuts down, the lights at this truck bay will probably stay on. "This is really a first step in the direction we want to take for larger scale installations," he added. He imagines expanding what he's created here to cover whole neighborhoods, and then linking those microgrids to create a flexible network. Microgrids are going up from Alaska to New York. But Reed's vision to lace several together is new, said Elisa Wood, editor-in-chief of Microgrid Knowledge, a web site devoted to the technology. "That's the cutting edge," Wood said. Compared to other cities experimenting with the technology, she added, "Pittsburgh is more advanced in its vision." Reed's microgrid work caught the attention of Pittsburgh's city hall. In recent years, Pittsburgh has enjoyed a renaissance, with tech companies Uber, Apple and Google opening offices and attracting young talent to live in the former steel town. Grant Ervin, the city's chief resilience officer, said the city wants to keep these newcomers by updating infrastructure that in some cases hasn't been touched since the golden age of steel. "The microgrid technology we've seen is a real opportunity to start to integrate renewable assets ... but also increase the resiliency and redundancy in the grid," Ervin said. Ervin said the city is helping coordinate between the university, a local power utility and private companies to build additional microgrids. And other cities are looking to Pittsburgh as a model, he added. After Hurricane Maria hit, Ervin said his counterpart in San Juan called, asking for advice on rebuilding Puerto Rico's grid to be more resilient as well. The city-wide microgrid project is still largely on paper. Still, it has contributed to the atmosphere of renewal in the city. Katrina Kelly-Pitou grew up in Pittsburgh and said she left when she was 21, planning to never return. She worked as an energy policy specialist across Europe and China, but in 2015, she was surprised to hear her hometown come up in a speech by Anne Hidalgo, the mayor of Paris, speaking at international climate talks. "She was talking about, 'there's this city in Pennsylvania who's starting to do some really cool things, have you heard of them, they're called Pittsburgh,'" Kelly-Pitou recalled. "She was talking on a platform about it, saying how blue-collar climate solutions could still be developed for the average person ... and I was like, 'Oh man, I have to get in with these guys.' "
Kelly-Pitou contacted Reed's office and he offered her a post as manager of strategy and business development. After a decade abroad, Kelly-Pitou returned home. After Hurricane Maria destroyed Puerto Rico's electrical grid, American cities are looking for more reliable ways to get their power. And Pittsburgh is one of them. Researchers there are working on an energy technology called microgrids that could help provide a backup to the main power supply. Daniella Cheslow reports. DANIELLA CHESLOW, BYLINE: The truck bay of Pitt Ohio company outside Pittsburgh is the flagship project of a microgrid experiment. Renewables power everything here from the LED lighting overhead to the electric forklifts. Gene Lutz drives one. GENE LUTZ: You know, they usually last about six hours before they need to recharge. CHESLOW: Jim Maug directs building maintenance. He says Pitt Ohio got tax incentives to install renewable energy. And the finances make sense. JIM MAUG: The entire program for this was just about 325,000. We're anticipating about a seven to eight year return on investment. CHESLOW: We visit the utility room where a ladder leads to the roof. MAUG: Do you want to stick your head out and see the solar panels? MAUG: Will you pop that open for her (unintelligible)? CHESLOW: I climb up and see 160 panels lying flat on the truck bay's white metal roof. There's a wind turbine out front, and it's all wired into a bank of batteries inside. Usually, power grids rely on a far-flung network. So you could be making toast using electricity from miles away. A microgrid is a much smaller and independent power network. During a storm, even if the local power plant shuts down, the lights at this truck bay will probably stay on. Gregory Reed of the University of Pittsburgh designed this microgrid - much of it manufactured right here. GREGORY REED: This is really a first step in the direction that we want to take for larger-scale installations. CHESLOW: The University's engineering school is working with the city and a local electric utility to build more microgrids. It's happening as Pittsburgh enjoys a renaissance. Tech companies have opened offices here in recent years. The young population is growing. And the city wants to keep these newcomers by updating infrastructure that, in some cases, hasn't been touched since the Golden Age of Steel. Reed imagines expanding what he's created here to cover bigger and bigger areas. REED: Perhaps neighborhoods or a downtown area or a college campus or even an entire industrial park. CHESLOW: A lot of places, from Alaska to Brooklyn, are experimenting with individual microgrids. But Reed's goal is to link several of them together to back each other up in an emergency. REED: We'll just walk through here. REED: We're going to go down the steps. CHESLOW: ...Like this energy efficient form of air conditioning. Reed walks down to what used to be a swimming pool. In it now our big white storage tanks filled with ice. REED: You make ice at night. You melt it during the day. CHESLOW: And it's piped through the building to cool it down. Innovation like this is driving Pittsburgh's renaissance, and other cities are paying attention. A few weeks ago, a San Juan official called city hall here. She wanted advice on making Puerto Rico's grid more resilient. For NPR News, I'm Daniella Cheslow. (SOUNDBITE OF BOARDS OF CANADA'S "ROYGBIV") Transcript provided by NPR, Copyright NPR.